Dry needling describes a musculoskeletal therapy technique where a solid needle (containing no medication or liquid – hence the term ‘dry’) is inserted into the skin and muscle tissue to treat a host of muscular conditions. This treatment is suggested to act upon areas of muscle tissue known as myofascial trigger points. These trigger points essentially describe tight, hypersensitive, and ‘bunched up’ sections of muscle tissue that have slowly developed too much neural ‘tone’, causing them to be chronically stiff and contracted. This can lead to pain, inhibited muscle function, loss of joint range of motion, stiffness, and even altered movement. But by acting upon these trigger points, dry needling is thought to reduce this unwanted muscle tone and tightness, thus restoring their function and reducing any associated pain and movement limitations. How is it different from other therapies? Now considering that there are literally thousands of diffident treatment types that are all suggested to improve muscle health and function, we thought it would be a good idea to give a bit of an explanation around how dry needling differs from some of its more popular alternatives. Acupuncture is a type of therapy that is thought to have originated in China well over 5000 years ago, in which it is built around the suggestion that health is actually determined how chi flows through the body – where ‘chi’ describes the vital life energy that is found within all living organisms. According to the theory of acupuncture, chi circulates throughout the body, running along twelve key pathways, known as meridians. Each meridian is said to be linked to specific internal organ and organ system. Within this, it is said that if this flow of chi is blocked, it can lead to health issues and dysfunction throughout the body. But by inserting very thin needles at certain points within these meridians, acupuncture is thought to redirect and improve the flow of chi throughout the body, reducing pain, tension, and discomfort. With all this in mind, dry needling and acupuncture are both very similar in their application – but the rationale does differ somewhat. As a result, dry needling tends to be used more locally to the areas of pain and tension, while acupuncture is used on various spots around the body. Massage is one of the most common forms of muscle therapy on the entire planet, where it is suggested to reduce tension and improve the health of muscle tissue. Performed by applying firm pressure to the muscle tissue and actively ‘working’ on tight sections of muscle, massage has been shown to enhance blood flow, lower the neural tone of hyperactive muscle tissue, reduce tension, and even aid recovery after exercise. With this in mind, massage is noticeably different to dry needling but can have very similar effects. It is firmly believed that some muscles may respond better to needling, whereas others may respond better to massage – as a result, these two treatment modalities are often used in conjunction with one another to maximize the effectiveness of a given treatment. The Graston Technique is a specific and patented form of manual therapy that actually uses stainless steel tools to treat muscular dysfunction. Similar to traditional manual therapy, these tools are moved over the skin and muscle tissue to break up any scar tissue within the tissue, thus restoring muscle function. In the same vein as manual therapy, this is very likely to be helpful when used in conjunction with dry needling as their mechanism of action is completely different. Transcutaneous Electrical Nerve Stimulation (TENS) is a specific type of therapy that uses the application of low voltage electrical currents to promote pain relief. Typically with TENS therapy, two electrodes are applied to the specific area of pain or muscle dysfunction, and the TENS battery provides an electrical current to that area. This electrical current is thought to stimulate the nerves within the muscle tissue, causing them to relax. This is also said to cause an increase in endorphin secretion throughout the body, which can blunt pain signals within the brain. TENS therapy is noticeably different to dry needling. With this, its effectiveness is the topic of much discussion, with some research demonstrating it be effective, and some suggesting it may not be effective at all. Cortisone injections are an extremely common treatment for chronic pain conditions that occur within joint structures. This injection typically contains both a corticosteroid medication and a local anesthetic, where it causes a large decline in inflammation combined with a significant reduction in pain. One of the biggest knocks on cortisone injections is that while they do indeed reduce pain in the acute sense, they do very little to help improve the root cause of the issue – meaning that they often only mask the problem and provide a short-term treatment option. It is important to note that a cortisone injection is typically used for chronic joint pain, and do not have the capacity to enhance muscle function. As a result, they offer a markedly different treatment method to dry needling. Is Dry Needling Legal Everywhere? While the American Physical Therapy Association does state that Dry Needling is well within the scope of practice for a regular Physical Therapist, there are some specific US states that have rules and regulations that do not permit it. As a result, it is illegal to practice dry needling in California, Florida, Hawaii, New Jersey, New York, Pennsylvania, Idaho, Kansas South Dakota, and Washington. 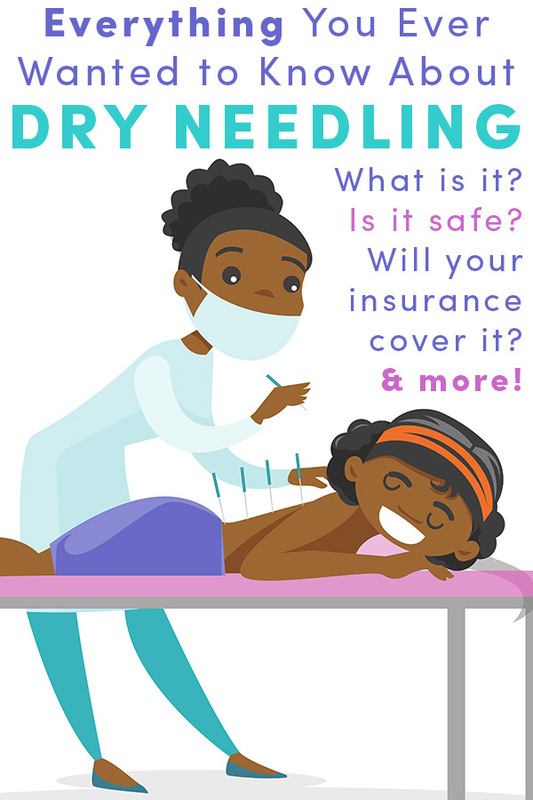 How Much Does Dry Needling Cost and is it Covered by Insurance? As the application of dry needling is most often performed by physical therapists, its cost can vary quite significantly between practices – this is because the cost of treatment is highly dependent on the specific practice (with some private practices obviously charging more than others). With this in mind, you can expect to be charged anywhere from 30 to 60 dollars per session. Additionally, despite dry needling being both approved and recommended by the Americal Physical Therapy Association, as it isn’t approved in every state it also isn’t covered by every single health insurance fund as many consider it a form of investigational medicine, rather than an effective treatment option. So, to find out if your private health care fund covers dry needing, we strongly recommend you read the fine print of your individual policy very closely. Dry needling is practiced by many physical therapists in private practices across the country (within the states that allow it of course). Your best bet would be to get in contact with your local therapist and see if they offer dry needling services. This is a simple way to find out whom in your local area routinely performs dry needling, and where your best treatment options may lie. What are the health benefits of dry needling? Given the mechanisms behind dry needling, combined with its widespread use across the country, you can see why it is considered to have such a large impact on health and function throughout the entire body. With this in mind, we wanted to have an objective look at the research to determine where its best use lies. Does Dry Needling Help Facial Wrinkles? Wrinkles essentially occur when the collagen fibers within the skin begin to break down, resulting in a loss of rigidity and function. This occurs in response to the exposure of the skin to toxins and chemicals over the lifespan, which is why this deterioration in skin quality and tone typically occurs as we get older. Unfortunately, while dry needling does help return muscle tone to normal, it does not have the ability to improve facial wrinkles or affect skin quality in any manner. Does Dry Needling Help Scar Tissue? Scar tissue is the fibrous, rigid, tissue that replaces normal skin and muscle after an injury. It is a natural part of the healing process, in which it allows the return and maintenance of normal function after a serious injury. While there has been some suggestion that dry needling may have the ability to restore the health of normal tissue, and therefore help return scar tissue to normal tissue, there is no evidence to suggest that this is the case. Does Dry Needling Help Headaches and Migraines? Headaches and migraines are often the result of tension caused by tight muscles around the cervical neck and upper back. With this in mind, dry needling has been shown to be extremely beneficial when it comes to treating these tension-type headaches, as it has the capacity to reduce the tone and tightness within these specific muscles. It is also important to note that it may not have the ability to treat headaches and migraines caused by internal issues. Does Dry Needling Help Shoulder Pain or Frozen Shoulder? In a very similar fashion to the above point, many shoulder issues are caused when the key muscles that act upon the shoulder joint become tight and dysfunctional. As a result, the application of dry needling to those muscles has been shown to assist in the treatment of shoulder pain in both the short and medium term, although these benefits are not significantly greater than those observed with traditional physical therapy treatments. It is also important to note that with frozen shoulder specifically, there has been very little evidence to support the use of dry needling – although this is most likely due to the issue itself, as very few treatments have been shown to have a positive effect on clinically diagnosed frozen shoulder. Does Dry Needling Help Bursitis? Bursitis occurs when the bursa within a joint becomes irritated and inflamed. While the cause of bursitis can be varied, it is often the result of muscular tightness and dysfunction of those muscles surrounding the joint, in which the bursa begins to get compressed. Taking this into consideration, dry needling may have the potential to restore normal joint function and reduce bursa irritation. This, in turn, may reduce the inflammation and pain associated with bursitis by helping treat the source of the problem. Does Dry Needling Help Back Pain or Sciatica? Low back pain is one of the most common musculoskeletal issues ion the planet, affecting nearly 90% of the population at one point in their lifetime. Fortunately, the application of dry needling has been shown to cause a significant reduction in low back pain in the short term, while also offering an effective treatment option in the long term as well. This appears to hold true for both non-specific low back pain and back pain driven by sciatica. This has been suggested to be due to its ability to restore the function of those muscles that surround the lumbar spine, reducing pain and associated discomfort. Does Dry Needling Help Temporomandibular Joint (TMJ) Disorder? The Temporomandibular Joint acts as a sliding hinge, where it essentially connects your jawbone to your skull. As a result, TMJ disorder describes an issue where pain and discomfort are present in the muscles surrounding the joint, and within the joint itself. There is evidence to suggest that dry needling can offer an effective treatment option for people suffering from TMJ disorder, causing significant reductions in pain in conjunction with large improvements in function. Does Dry Needling Help Plantar Heel Pain (Plantar Fasciitis)? Plantar Fasciitis is an extremely common foot complaint that typically presents as a sharp pain under the heel upon taking your first few steps of the day, which then slowly becomes a dull ache for the remainder of the day. This is essentially caused by inflammation within the fascia (the thick bands of connective tissue) that lines the bottom of your foot. Interestingly, some research has shown the dry needling may offer an effective treatment for plantar fasciitis, causing significant reductions in pain combined with large improvement in function. Does Dry Needling Help Piriformis Syndrome? Piriformis syndrome is a specific muscle condition where the piriformis muscle (a small external rotator of the hip located in the buttock region) becomes extremely tight and causes significant pain. This tightness can also lead to irritation of the sciatic nerve (which runs next to the piriformis muscles), leading to further pain and discomfort, often combined with numbness and tingling along the back of the leg and even into the foot. Dry needling has been suggested to act as an effective treatment for piriformis syndrome, as it has the capacity to reduce the tightness of the piriformis muscle, thus reducing pain and discomfort. Does Dry Needling Induce Labour? While some people have suggested the dry needling does have the ability to induce labor, there is currently no evidence to suggest that this is the case. As a result, we can safely assume that it does not have this capacity. Does Dry Needling Help Sinus Issues? Unfortunately, many sinus issues stem from either structural abnormalities within the sinus cavities, or from allergic reactions to airborne pathogens. As a result, dry needling does not have the ability to treat sinus issues and improve sinus health. Does Dry Needling Help Arthritis? Arthritis describes an issue where structural damage within a joint result in pain, inflammation, discomfort, and a loss of function. This typically includes a reduction in the range of motion at the joint, inhibited mobility, both combined with sensations of extreme joint stiffness. While there is minimal research looking into the effectiveness of dry needling as a treatment for joint arthritis, it is highly unlikely that it has the ability to reduce inflammation within the joint, nor repair any of the damaged joint structures that are causing the problem. As a result, we cannot recommend dry needling for the treatment of arthritis. Does Dry Needling Help with Weight Loss? To lose weight in the simplest sense, one needs to expend more energy than they consume on a daily basis. Given that dry needling does not have the ability to increase energy expenditure, it does also not have any capacity to help with weight loss. Does Dry Needling Help Fibromyalgia? Fibromyalgia is one of the most common musculoskeletal disorders of the modern day. While its cause still remains unclear, its symptoms include general fatigue, chronic joint and muscle pain, and often an associated decline in general health. With this in mind, although there is no clear cure, common treatments often include stress management and meditation, exercise, and healthy lifestyle changes. As Fibromyalgia is a global pain disorder rather than a localized muscle issue, there is currently no evidence to suggest that dry needling can assist in its treatment. Does Dry Needling Help Shin Splints? The term “shin splints” describes an issue where pain is felt along the front of the lower leg, or shin, between the knee and the ankle. As a specific condition, shin splints are often referred to as medial tibial stress syndrome (or MTSS). Shin splints most commonly afflict people who engage in large amounts of moderate to heavy physical activity. With this in mind, they often occur to people who play frequent high impact sport such as basketball or soccer. Taking this into consideration, Shin splints are a disorder that results from the accumulation of physical stress, where the repeated pounding of the lower legs places excessive stress on the bones and muscles, resulting in your body being unable to naturally repair and heal itself. There is a small amount of research to suggest that dry needling may help reduce some of the muscle pain associated with shin splints, but it does not appear to offer an effective treatment option on the long term unless it is combined with rest (allowing the tissue some time to heal). Does Dry Needling Help Tennis Elbow? Tennis elbow (also known as lateral epicondylitis) is a musculoskeletal condition that is typified by pain being present on the outside of the elbow (on the lateral epicondyle of the elbow). It is a degenerative condition that occurs when the tendons that attach to the lateral portion of the elbow become tight and inflamed in response to overuse. Common treatment methods for tennis elbow often involve rest, in conjunction with some very specific exercise interventions. There is currently no research to suggest that dry needling offers an effective treatment modality for tennis elbow. Is Dry Needling Completely Safe? There are a number of precautions that need to be addressed when using dry needling as a treatment option. Taking these into consideration, it should not be used in patients who have abnormal bleeding or a compromised immune system, nor with individuals with any form of vascular disease or who are within the acute healing phase following joint surgery. It is also important to note that while there is no evidence to suggest that dry needling is unsafe for pregnant people, we believe that it should be avoided in the first trimester of pregnancy, as miscarriage is fairly common within this time of development. There is also a slim chance that some individuals may be allergic to some of the material present within the needles themselves. In this scenario, dry needling can still be an effective treatment option, but specific non-allergic needles will be required. Dry needling appears to offer an excellent method of treatment for many musculoskeletal disorders, although it has little capacity to improve and treat any joint specific disorders, bone or cartilage disorders, or any disease and illnesses. With this in mind, it also appears to be best used in conjunction with other physical therapy treatment modalities to ensure that the best care available is provided. ← What is Energy Healing and Why is it Recommended.